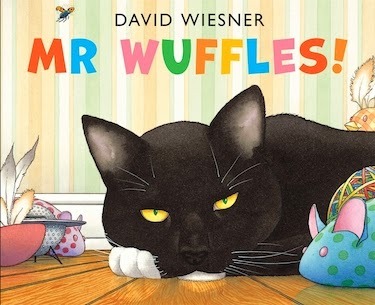 Mr Wuffles is an almost wordless children’s picture book created by David Wiesner, and published in Australia by Random House. There are teacher notes available at Random House website. Take a look at the cover above. See that tiny bumpy cat toy between the feathery thing and toy mouse? Turns out it’s actually a tiny spaceship. Just like the Tardis, it’s much bigger on the inside and is filled with alien explorers who don’t realise the adventures ahead for them. Mr Wuffles loves this new “toy”, but we also see from the aliens' perspectives that being batted around by a furry paw causes considerable consternation. Luckily the aliens join forces with the household insects, and together they make a plan to defeat the cat. Such a brief summary doesn’t do the book justice of course. There’s lots of visual detail contributing to the clues we piece together to work out what’s going on. Occasional speech bubbles, including some in alien speech, help us too. Young readers will love delving into the details and discussing what they believe is happening. The world Wiesner has created will fascinate and delight kids who’ll ensure this is one children’s picture book that will fly off book shelves! I LOVED this book! The alien twist was cool!